This card is activated when the opponent has 3000 LP of less. Each of his standby phases, he loses 500 LP. Today we look at another card that's built for burn decks. It's like a countdown to death for the opponent if he cant do anything to destroy it. It's a welcome addition to burn decks as the last few thousand LP is the hardest to destroy as you're running low on burn cards. This card will help you immensely in these situations. I remember using 2 in my old burn deck. In a burn deck, I'd give this a 3.7/5. SandTrap Here's a 3rd card that you want to stay away from. Kiddies, hide, hide! This card is no good! It is evil, and not it a good way. Well, this card sounds OK, but it's not. 500 a turn would be decent, but then there's that restriction. Your opponent must already be under 3001 LPs in order to use this card. That means that this card is useless unless you do enough damage with other cards in order to activate its effect. 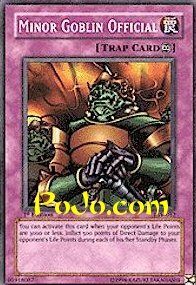 And while you're trying to get under that 3000 LP restriction, you'll have this card burning a hole into your stubby little fingers. If, somehow, you manage to get your opponent under 3000 and still have some sort of field control, then you can activate this card and stall until your opponent fries to death. But chances are that, in a Burn deck, you'll be on the defensive right off the bat, and your opponent will be nailing all your m/ts, thus leaving you open to a flood of monsters.